For Doug and Julie, the journey towards their dream home went beyond choosing the perfect location and creating a custom design; they wanted to build the home themselves. So after years of thought and research, the couple purchased farmland in Western Kentucky. With their lot secured, they began the search to find a company that would be able to provide an integrated system of timber framing and structural insulated panels (SIPs), while still giving them the freedom to finish the rest of their home construction on their own. 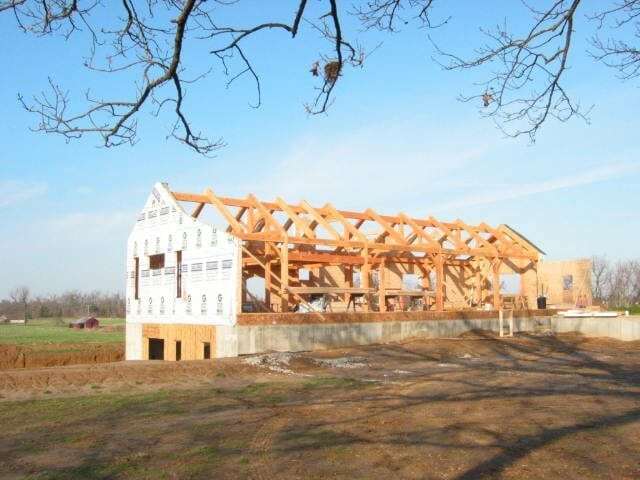 Remembering Riverbend Timber Framing from a regional timber home show they had attended in Saint Louis, Doug contacted the company with his vision. After much consultation with his regional representative, Doug was paired with M.T.N designer, Marty Birkenkamp, to begin his design process. As a result of their collaboration, Doug’s final design included an open layout that emphasized the kitchen area as well as the loft space over the great room. Its ranch style design added a unique look to the traditional framing, while fitting in well with the surrounding property. Once the design had been finalized, Riverbend’s manufacturing facility cut the home’s timbers and SIPs to precision, and later a technical assistant (TA) was present to ensure the quality of the timber frame and SIP installation on the couple’s lot. “The integration of timbers and SIPs, along with a geothermal system, keeps our home very comfortable and our energy consumption low.” Doug said. Today, Doug and Julie are still in the process of finishing out their custom timber frame home. Their interior spaces have only minor trim work to complete, and the final exterior landscaping and porch installations are underway. “I am doing all the custom work myself, so it has been a slower process than if we had hired someone, but it is a process I am happy to go through!” Doug said. By choosing to continue building the home on their own, Doug and Julie were able to incorporate finish elements that are completely unique. For example, all of their interior doors are crafted from cherry wood that was salvaged from their own farmland. For photos of Doug and Julie’s DIY home progression, stay tuned to Riverbend’s Facebook Page.